Disclosure: I was sent a review copy from the publisher in exchange for an honest review. All views shared are mine and mine alone. My husband and I like watching, "Innovation Nation" an invention show on television on the weekends. A couple weekends ago my girls sat to watch the series with us, and they were intrigued. Like us, they enjoyed learning about how products are made and the stories behind many of the inventions from today and yesteryear. After we were done watching the show, the girls started to thinking about and looked around the room at things and wondered where they came from and how they were made. As they were looking around, my daughter got a scratch and needed a band-aid. She wondered as I was putting the band-aid on how it came about. I was happy she asked this, as I was recently sent a book that would answer just that question. 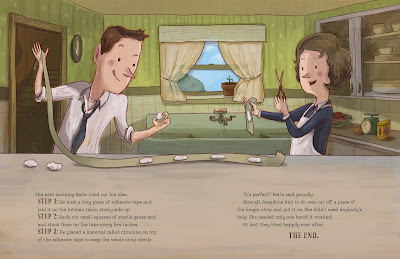 Not only would it be a fascinating read for both kids and adults, but the story is fun and engaging and the illustrations really bring the story to life and have you wanting to read on and flip the page to see what happens next. 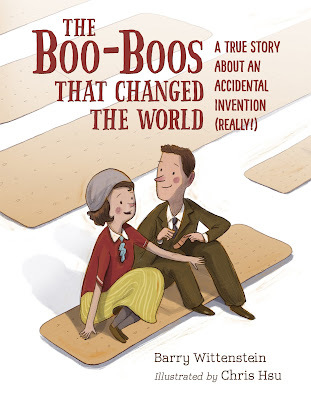 The book is called, "The Boo-Boos That Changed the World: A True Story About an Accidental Invention (Really! ), and it is all about how band-aids came about. Did you know Band-Aids were invented by accident?! And that they weren't mass-produced until the Boy Scouts gave their seal of approval? Do you know who or why band-aids were made? I always thought they were made in a factory and were something of a happenstance while making other medical supply stuff. I never imagined it was made by a man for his wife who always seemed to injure herself, and that eventually it would become a hit with the Boys Scouts, for those in the military and more. I remember back when band-aids came in the wrapper with a little red string to pull and easily open the package. Do you? When I read this in the book to the girls, they said "No, band-aids don't come that way," as they are used to their character band-aids that they collect and wear whenever they want -- not just to cover a boo boo. My girls think they are stylish and fun to wear, and I even find them stuck around the house. Are your kids the same way? I could buy a box of band-aids and within a few days they are gone. Thankfully, I stock up and stash band-aids for when the girls really need them. Barry Wittenstein has always been involved with writing, from contributing to his high school and college newspapers, to writing and performing poetry on stage in San Francisco, songwriting, sports writing, and now picture books. He has worked at CBS Records, CBS News, and was a web editor and writer for Major League Baseball. He is now an elementary-school substitute teacher and children's author. Listen to the podcast interview! "1920s cotton buyer Earle Dickson worked for Johnson & Johnson and had a klutzy wife who often cut herself. The son of a doctor, Earle set out to create an easier way for her to bandage her injuries. Band-Aids were born, but Earle's bosses at the pharmaceutical giant weren't convinced, and it wasn't until the Boy Scouts of America tested Earle's prototype that this ubiquitous household staple was made available to the public. Soon Band-Aids were selling like hotcakes, and the rest is boo-boo history." 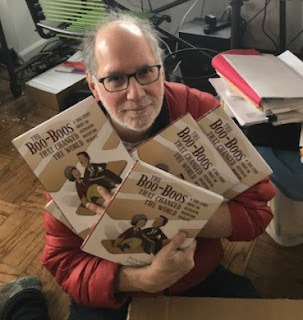 This book also includes a fun Earle Dickson Time Line section at the end of the book so you can see chronologically how the band-aid invention came about. My girls really enjoying going through the dates after reading the story, to refresh their memories on the stages of Earle's invention of the band-aid. In addition to Earle's timeline, there is also an "Other Medical Inventions From the 1920's and 1930's," where readers can learn about how things came about like the first vaccine for tetanus, when insulin was discovered and used for treated for diabetes and even when the first iron lung was used. When we think of inventions we usually think of actual products that are made and not about life-saving inventions like vaccines and even the blood bank which was established in the US in 1937. My girls really enjoyed this book and learning all about band-aids. And for the past few days they have been sharing all about Earle Dickson and his clumsy wife and how band-aids came about, to whoever will listen. Everyone who stops to listen are amazed at this true story and find themselves wondering about what other small inventions that are used on a daily basis or frequently that we take for granting or don't usually think much about. If you would like to learn more about the band-aid invention, or share a unique and interesting story with your child, then you will want to pick up this book. As a homeschooling family, this is definitely one book we will pick up and read again, and pass around to other homeschooling families. This week my girls are brainstorming and trying to come up with a list of inventions that they would like to learn more about, so that we can do research at the library and see if they have an interesting back story like the band-aids one we read. I love when a book gets the wheels in their head spinning and has them thinking more about things, and wanting to learn more. 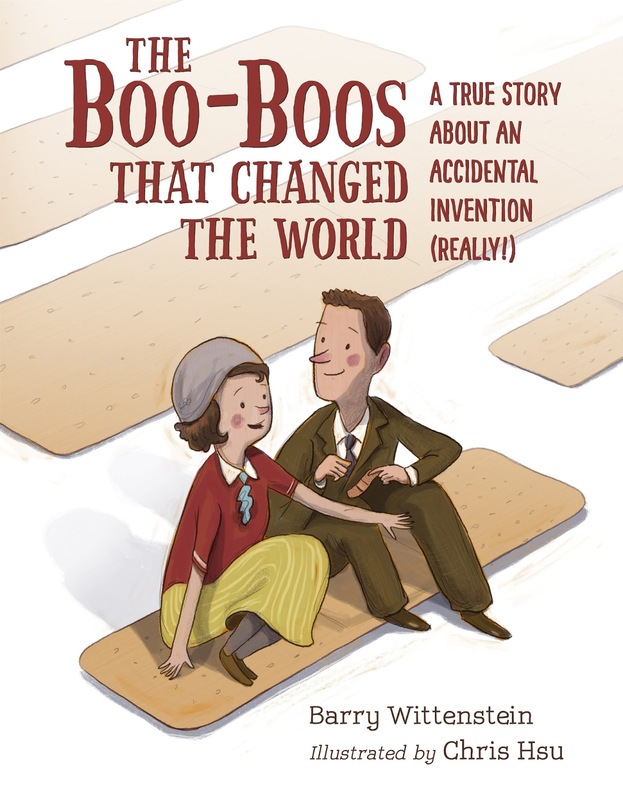 So, if you are looking for a fun and interesting book to share with your children, that will not only entertain but maybe even inspire them to invent something or learn more about inventions, then you will want to pick up a copy of "THE BOO-BOOS THAT CHANGED THE WORLD" by Barry Wittenstein today. Looks like an interesting book! The illustrations are great! Thanks so much for reading our book, and the very thorough review of it! I’m very happy it was a story that got your kids thinking even further. I'm a Peppa Pig Parent! Inspiredbysavannah 2018. Powered by Blogger.